So we thought we’d follow up on our comparison with the Midnight version of our minimal calendar App “The Grid” as compared to Fantastical. Fantastical 2 has come out with a few new features so we’ll try to update our table to show new features that have come along since we wrote this… (And we won’t even think about showing a table like this against Extreme Agenda, needless to say it has all of the Midnight Grid features and SO MANY MORE). Thanks for considering ‘The Grid’, and if you aren’t convinced try out the FREE version and give it a try before upgrading or buying Midnight. Or go all out and explore Extreme Agenda for new levels of productivity. 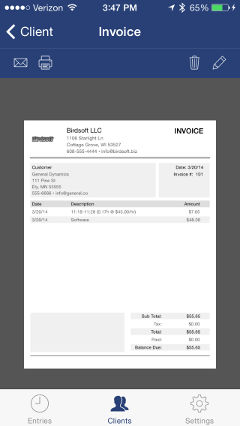 This entry was posted in Birdsoft, iPhone, Productivity on February 2, 2014 by Administrator. 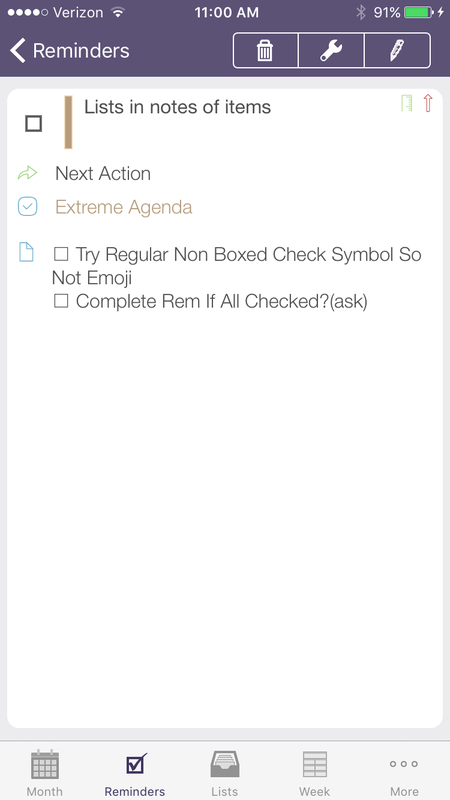 With version 4.1 of Extreme Agenda we have not only done a lot of work cosmetically to make it beautiful for iOS7, but we have went over some areas with a fine toothed comb to add features that would be helpful to you. One of the areas that got a lot of attention was reminders. 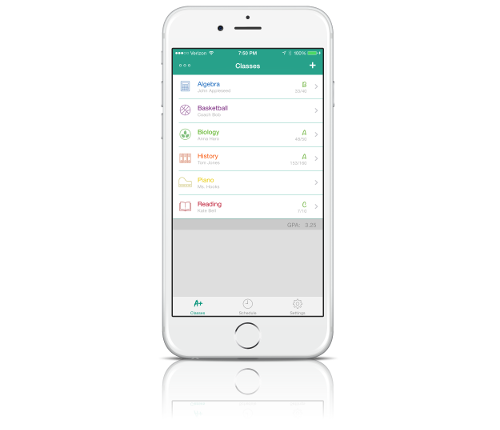 We hope to offer a solution for those people that want to use the Getting Things Done or GTD methodology on iOS, to use our app and reminders to achieve optimum productivity. So let us explain a little about how we approached this. 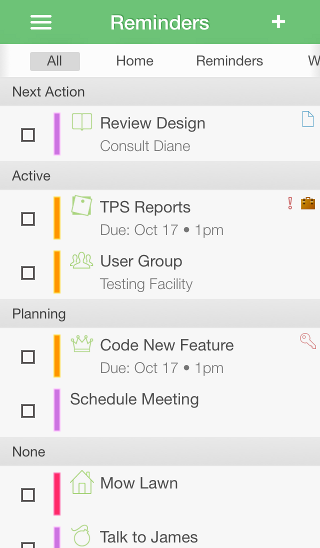 In GTD you take all of your things(items) you need to do, and you sort them based on projects. In Extreme Agenda we suggest you use the reminder calendars for these, so in 4.1 we added a few things to make this more powerful. One, you can now go into the calendar list in settings and add and filter by these reminder calendars just like you could with event calendars. We now also allow the showing of a calendar tab bar across the top on the reminder list that will quickly filter the list down to only one ‘project’. And in the main settings app, which we use, is the ability to set a default reminder calendar, so you can consider creating a reminder calendar called ‘Inbox’ and set it as the default(in main settings app under ‘Reminders > Default List’). Next in GTD there are contexts. This is the ‘where’ or the ‘what is needed’… That sort of thing. How about using categories for this. 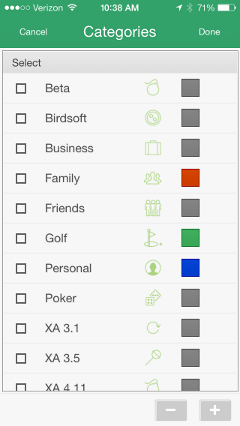 They are basically tags that you can then filter by across the entire app. From the reminder list you can just hit the sidebar or menu and choose filter to turn it on and quickly toggle the categories shown. 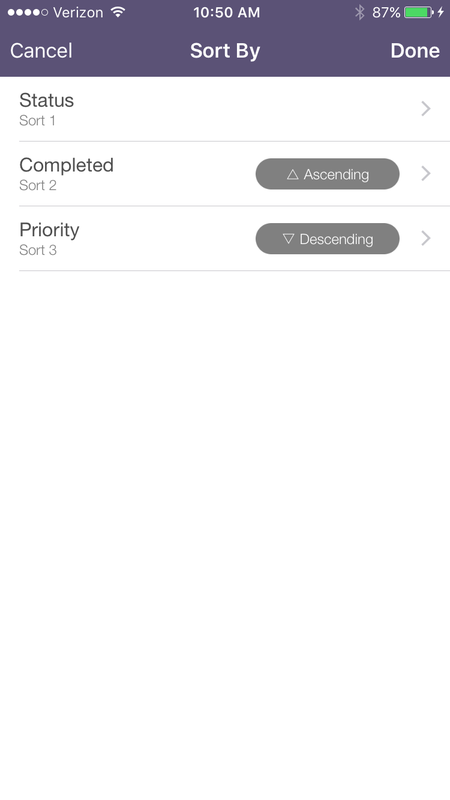 And finally in GTD you sort your things by actions. Well this is easy, as another part of our reminder extensions we offer a ‘status’ or action field. And you can sort by this status in the ‘sort’ of the reminder list. We know that in order to move your things around you want to be able to quickly set this status. In 4.1 we added the ability to hold down on a task, and a tool will pop up allowing you to select a new action, and hit set to make quick work of this. And if that wasn’t enough you can now hold down on the ‘+’ button on the reminder list top bar, and a toolbar will appear with the option to add a reminder template. So you can use our system to create quick templates that are assigned to your projects(calendar), contexts(categories), and status actions. Note: We plan to change templates so you do not have to have a subject to make this easier. Set up your system to hide completed reminders, and as you go you will see and feel your todo items shrink into oblivion. 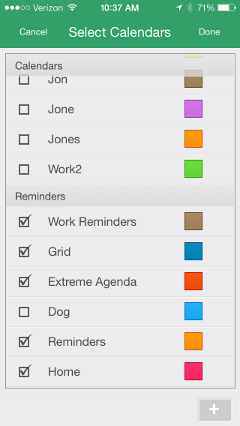 We also added the ability to show only the active(and overdue) tasks in your list. 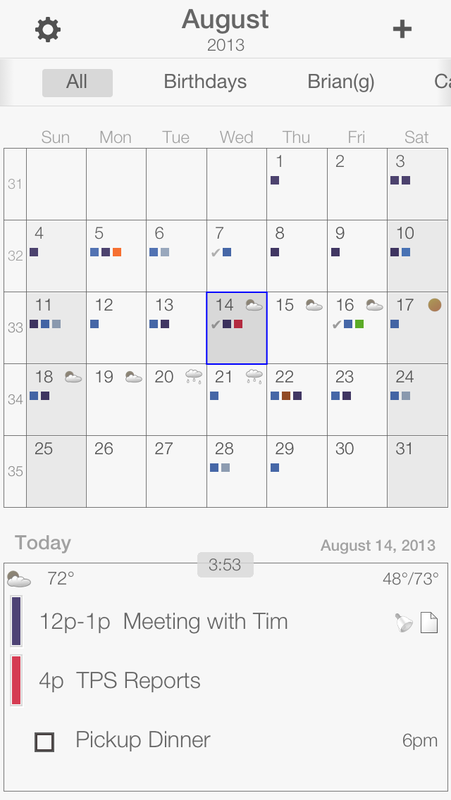 Dates can be an important part of your GTD setup, so filtering the Reminder List yet again to only show reminders with active dates further helps in your organization and goals. Extending that thought further throughout the whole app you can be assigning events to the same categories, and create similar calendars for events and reminders, and then filter the whole system using this. You can now use this to only one manage one project, or only the contexts available. And it is an option that with one button press you can quickly convert a reminder to an event, and back again. 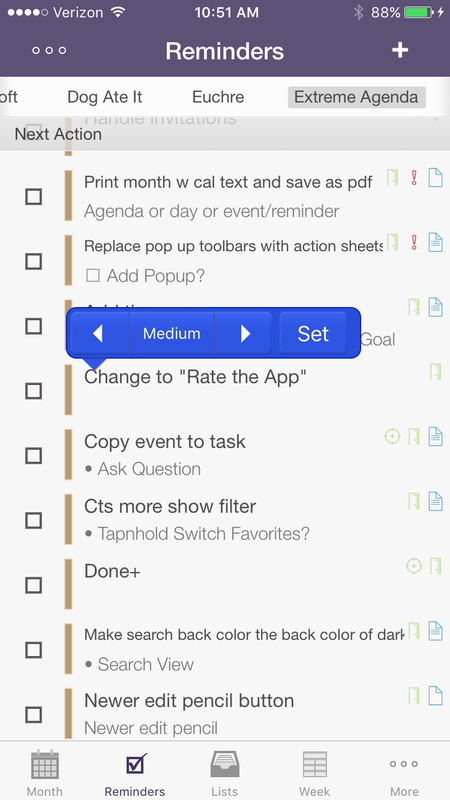 We know that not everyone flows this way, but all of these features should help in the way you choose to organize and attack your todo reminders. Knowing this we allow you to change things like the action popup toolbar to allow you to change the priority instead. Sort by highest priority and attack and re-sort. We hope that makes it easy. 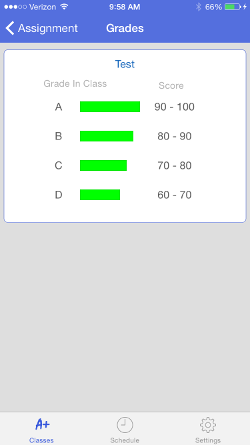 So we hope that we have made great strides in using a system like GTD along with our app. But we know there is more to do, and we don’t claim to be GTD experts. In fact we just picked it up, and tried to use it to plan the creation of version 4.1. So if you have ideas or questions please feel free to let us know. 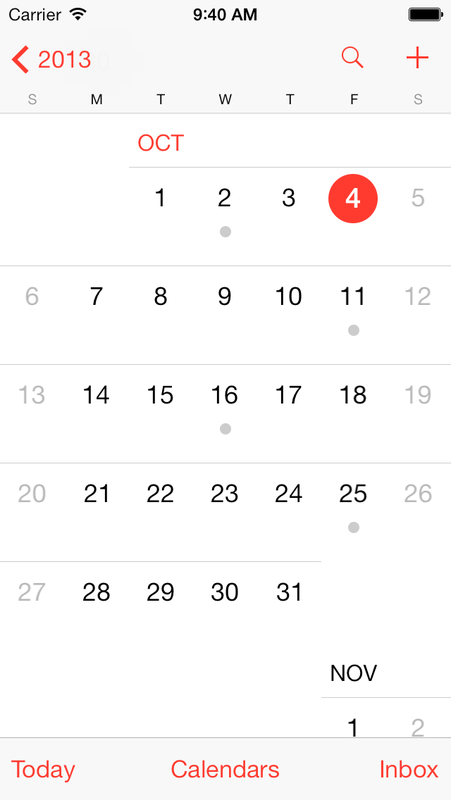 This entry was posted in iPhone, Productivity and tagged agenda, calendar, gtd, ios, ipad, iPhone on October 25, 2013 by Administrator. One of the biggest changes Apple made in creating the new iOS7 is to completely revamp what was already working with more minimal and sometimes less recognizable versions of their core apps, like calendar. Clean and white is great, but at some point what you are stripping out or re-formatting might not be making something more helpful to all people. Which is more useful for you? And ultimately looks more like what you expect a calendar to look like? And these alternative iOS7 calendars offer almost all of the same features as the built-in calendar like search and a week view, use the same data and syncing, and add great features that Apple hasn’t added. Drag-n-drop, templates, customization … and way way more… In fact these apps are sometimes the inspiration for the new things Apple does do. So if you are not satisfied with the iOS7 calendar remember that that’s what the AppStore is for. There are tons of great third party calendar apps out there that show you more information, give you more features, and can still have a clean style. The Grid and Extreme Agenda are too great examples, and The Grid is even free to try. Enjoy the good things that iOS7 has to offer and the flexibility to change what you need to. This entry was posted in iPhone, Productivity on October 4, 2013 by Administrator.